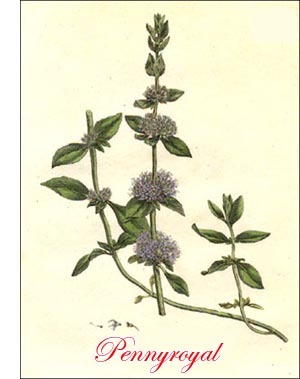 Pennyroyal (Mentha Pulegium, Linn.) is a perennial herb of the natural order Labiatae, native of Europe and parts of Asia, found wild and naturalized throughout the civilized world in strong, moist soil on the borders of ponds and streams. Its square, prostrate stems, which readily take root at the nodes, bear roundish-oval, grayish-green, slightly hairy leaves and small lilac-blue flowers in whorled clusters of ten or a dozen, rising in tiers, one above another, at the nodes. The seed is light brown, oval and very small. Like most of its near relatives, pennyroyal is highly aromatic, perhaps even more so than any other mint. The flavor is more pungent and acrid and less agreeable than that of spearmint or peppermint. Ordinarily the plant is propagated by division like mint, or more rarely by cuttings. Cultivation is the same as that of mint. Plantations generally last for four or five years, and even longer, when well managed and on favorable soil. In England it is more extensively cultivated than in America for drying and for its oil, of which latter a yield of 12 pounds to the acre is considered good. The leaves, green or dried, are used abroad to flavor puddings and other culinary preparations, but the taste and odor are usually not pleasant to American and English palates and noses.